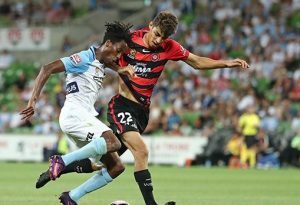 The Wanderers, who suffered their fourth loss of the season on the weekend, a 1-0 defeat to Melbourne City, are heading to their lucky charm ground, Campbelltown Sports Stadium on January 22, when they will host Newcastle. Campbelltown Sports Stadium will kick off the new year in style when it hosts the A-League reunion match between the Western Sydney Wanderers and the Newcastle Jets on Sunday, January 22. Local football fans can expect an electric atmosphere at the ground for the round 16 match, as the Wanderers aim to repeat their convincing win against the Jets in 2013, when the two teams last faced off in Campbelltown. And a win -any win – would be welcome relief for the western Sydney team coached by Tony Popovic since it was established. The club has had an indifferent start to the 2016-17 A-League season, netting a record number of draws. It has drawn eight of its 14 matches, more than any other club in the league so far. Wanderers, who sit just outside the top six on the ladder, have won just two matches, but losing not many more, four. Maybe they need to come to Campbelltown to get the Wanderers mojo back – time will tell. Mayor of Campbelltown, Cr George Brticevic, welcomed the Wanderers’ return, saying the elite level football match would be the first major event of a busy schedule planned for the stadium this year. “The Wanderers will also play their three AFC Champions League home games at Campbelltown Sports Stadium in 2017, so we’ve got a lot to look forward to this year,” he said. “We love our football here in Campbelltown, so I encourage residents, and fans from further afield, to come along and enjoy watching the Wanderers take on the Jets, live, at a great stadium. Campbelltown Sports Stadium has easy public transport access and ample parking. The Wanderers versus Jets match will kick off at 5pm, as the second game of a double header, which will see the Wanderers play Canberra United in the Westfield W-League, with a 2.30pm kickoff. Stadium gates will open at 2pm. Ticket prices range from $11.50 for juniors through to $49 for family passes, and are on sale through ticketmaster.com.au, or on game day at the gate. ♦ The Wanderers’ AFC Champions League fixtures at Campbelltown Sports Stadium, will see the Red and Black take on Japan’s Urawa Red Diamonds on February 21, FC Seoul on April 11 and the winner of play-off three on May 10. Tickets will be on sale to the general public for individual matches through ticketmaster.com.au from 2pm on Friday, January 27.